Plyers dribble in a 5 x 5 box using both feet. Coach introduces changes of direction one at a time (pull back, inside hook, outside hook and Cruyff). - Coach can introduce different speeds and also other foot skills such as toe taps, side to sides and juggling. This exercise shouls start at a slower pace and finish being done at a high pace. 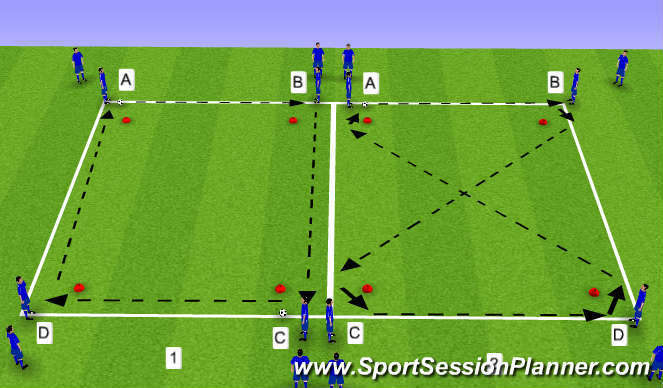 Coming out of the boxes 2 players stand between the first 2 cones and two players face them at the other side, both with 1 ball bwtween 2. Each space should be filled (can also have 2 players at one side with a ball and 1 player at the other without if you have odd numbers.) Players begin by dribbling the ball to the other side at a reasonable pace using both feet. Focus should be on a longer stride and less touches on the ball. The coach can introduce toe taps, side to sides, and change of direction from the center or passing from a set point...be creative. Coach can also introduce longer passes, over laps and give and go&apos;s from this activity, as well as dynamic moement after stopping the ball at a set point. Players pair up; one player starts without the ball in the central small box and the other players with the ball find a space between the cones on the outside. The central players check out to receive a pass from a player on the outside, control and pass it back. They then jog through the central square and check out somewhere else. Coach can introduce opening the body with first touch, changing direction, controlling the ball from the air etc. - Coach can also progress to players in the center having the ball and having over laps, give and go&apos;s and loinger passes. 1. 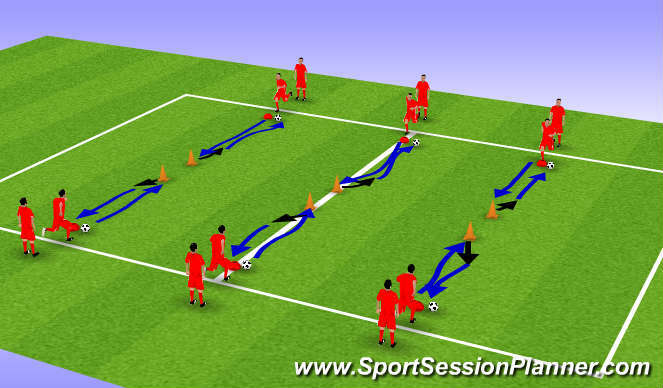 Players dribble into the central cone, change direction using the pull back and then dribble back to their partner. 2. Same as above but with inside hook. 3. Same as above but with outside hook. 4. Same as above but with the Cruff. 5. Increase the pace at which the exercise is completed at. Can make a game out of it, first team to finish 10 reps.
1. 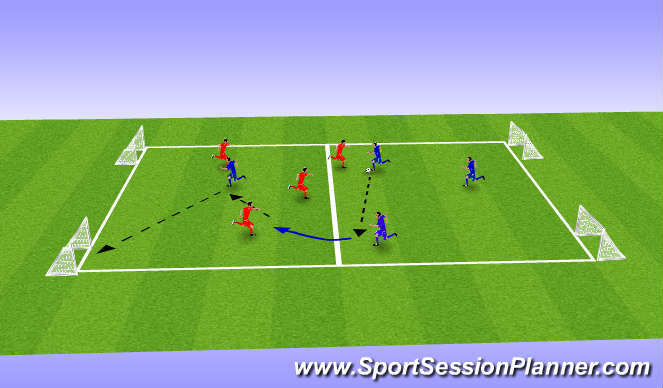 Players dribble into the central cone, change direction using the pull back and then pass the ball back to their partner. 5. Increase the pace at which the exercise is completed at. Can make a game out of it, first team to finish 10 reps of a particular change of direction. Set up anywhere from a 10 x 10 to 30 x 30 box based on ability and leave plenty of space between boxes. 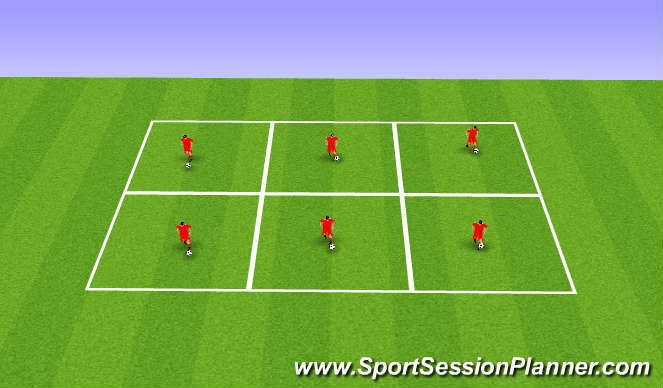 2 players at each cone, 2 balls in the exercise that start in opposite corners. Sequance follows A-B-C-D-A. 1. 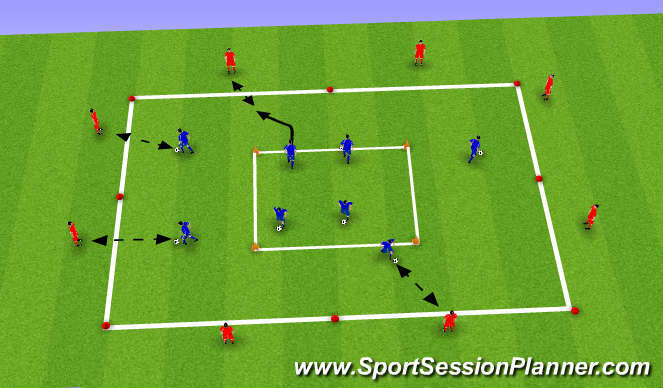 Players pass the ball to the next player in the box sequence with 2 balls moving at the same time. The player who passes the ball follows their pass to the next cone and become the spare player, the spare player at each cone always moves in and becomes the active player. Coaching Points: 1. Quality of the pass 2. Pass to the back foot so that the players are receiving across their body 3. Open body position to receive the ball 4. Soft first touch to set up a quick pass to the next player. 2. Players now have to create good angles/body position to receive the ball so that they can deliver the next pass in the sequance which now involves a diagonal ball. The spare player at A should be ready to receive the ball right away. Players are encouraged to sprint to the next station after passing.